Make over your home with the striking appeal of porcelain tile. 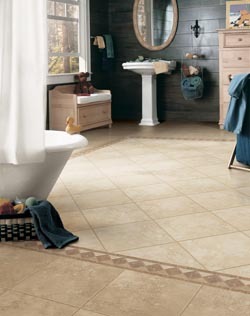 Did you know that adding porcelain tile flooring to your home or place of business increases the value of your property? Yes, it is true for this flooring option stands the test of time and always looks elegant. Discover the myriad possibilities of tile in your own home by inviting one of our design and sales professionals over for a free consultation. We bring the samples and the product knowledge, so you can ask all the questions you want and envision how porcelain tile installation looks in your space. Porcelain floor tile is a flooring classic that works well with every décor from modern to traditional to eclectic. We offer tile in a pleasing selection of sizes, styles, colors, and patterns. Many people choose porcelain tile floors for rooms that have high levels of humidity, such as the kitchen, bathroom, basement, or laundry room. However, we recommend porcelain for any room of your house. Think of a grand foyer with a pattern of mosaic tiles, a dining room that is easy to clean, and a bedroom with soft color and subtle patterns. These are just some of the decorating possibilities you have with tile flooring. Installing a porcelain tile floor requires precise measurements and meticulous attention to detail. Needless to say, it is a job that is best left to the professionals. When you purchase your porcelain flooring from our local store, we send experts to your home or place of business to handle the installation. These professionals take precise measurements, which is essential so that as few individual tiles are cut as possible. We hide these partial pieces at the edges of the floor, under the counters, or along the baseboard. Installing tile takes time for each piece must set in the mortar and the grouting has to be applied carefully. If tile is not laid correctly, it is vulnerable to cracking and breaking. When done properly as these technicians do, your porcelain tile flooring is a thing of beauty now and for decades to come. In fact, we are so confident of the installation, that our store provides a lifetime guarantee. If you have concerns about your porcelain tile floor, just let us know and we take care of the problem at no cost to you. Kiln firing at high temperatures is what makes porcelain tile strong and dense. This type of flooring resists stains and spills and is hypoallergenic. Your family breathes easier with tile underfoot as there are no fibers to hide dust mites, mold, or mildew. It is easy to clean porcelain tile floors. All you need to do is dry mop away dust and dirt and damp mop upon occasion, using a tile cleaning product. Tile wears well and is ideal for a busy household with children and pets. Contact us today to install the strength and beauty of porcelain tile in your home. We proudly serve residential and commercial customers in Valrico, South Brandon, Fish Hawk, Riverview, and New Tampa, Florida.